verb. separate, or cause to separate into pieces as a result of a blow, shock or strain. noun. an interruption of continuity or uniformity. i haven’t posted in a while. i took a break. i just didn’t know what to say. i didn’t know what i was feeling these last few weeks. i had to take some time and organize and compartmentalize what had happened and how i felt about all of it. and i’m pretty sure if i had posted my disorganized depressed mumblings i’d have lost you guys. no one wants to read that crap. people have asked me “what are the next steps now?” to which i say “i’m on a break.” that sounds really nice doesn’t it? like, i have chosen to stop these wheels that have been churning for nearly 2 years… on purpose. like it was MY decision. it makes it sound like i decided it would be best to rest. recuperate. sure, i think that’s probably in my best interest. IVF is brutal. but it wasn’t my decision. a forced break. my body cannot physically DO anything baby-making related these next few weeks. it is 40 shades of confused. trying to re-set itself, to remember how to function without the manipulation of stimulants, steroids, blood thinners and antibiotics. magician told us the earliest we can cycle again is december. that feels like an eternity away. but it doesn’t matter. we won’t try again for a while. i need a break. mentally i have checked out. well that’s no surprise! seriously. actually, i find myself not really thinking of anything pregnancy-related. instead i am slugging caffeine and sipping delicious wine. i am eating my weight in chocolate. for that last 2 years i held off on buying that cute top because i hoped to be pregnant in the next month and “it wouldn’t fit then so don’t buy it”. screw that. i am buying that sh*t. no more “i’ll be pregnant soon.” i am focusing on now. being present in the moment and trying not to think about the future. and i am desperately trying to forget the disappointments of this last year. the wine helps with that. a little. i have another EDD coming up. more wine please. i’m on a break. and i’m so very broken. i’m watching the world continue to spin and i am standing here frozen in time. on my knees, sweeping up the pieces and putting them back together. they are jagged and sharp. and no matter how much glue i use they don’t quite fit the way they used to. they are forever changed. the holidays are coming. where is the wine. this is when it gets exponentially hard. these are the weeks where you gather together and reflect on how blessed you are. recall what a wonderful year it’s been. and raise a glass to the bright shiny future that holds so much promise. i am blessed. i know this. and i am tortured at the same time. it’s been a wonderful year watching amazing son grow into a hilarious smart little human. my relationship with amazing husband has grown deeper than ever before. and it’s been a devastating year all the same, with much too much grief and sadness. and what now of that shiny future? on january 1st does everything magically change? with the stroke of the clock suddenly everything is coming up puppies and rainbows? i think not. but i am broken. so there’s that. maybe this break is for the best. it’s so hard to keep any faith after so many let downs. maybe time will heal these wounds. maybe. maybe distraction is what i need. we decided we needed to do something fun. 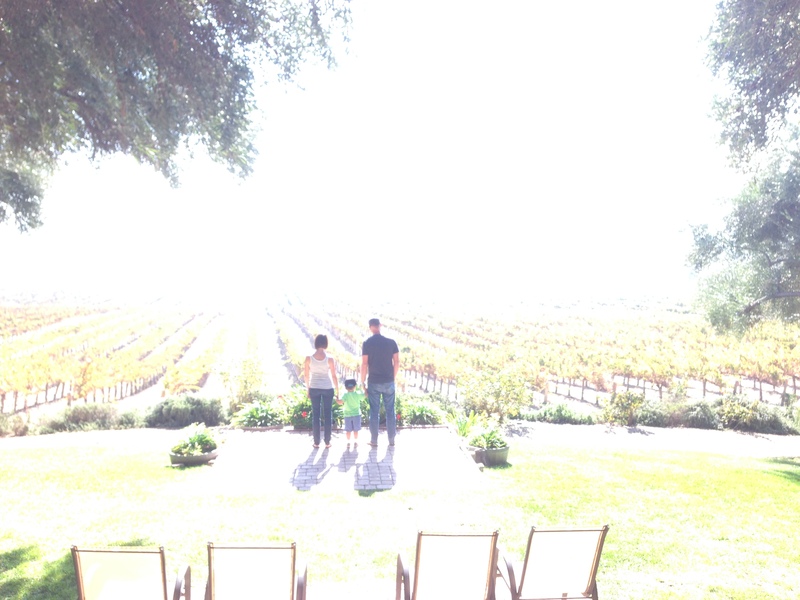 this weekend we took a mini-vacay, went to stay with friends who moved to wine country. and as luck had it we got to visit the place where we were married, this time with my sweet boy. walking the grounds of the vineyard the feelings came rushing from all different angles. memories flooding my mind. how excited i was to begin my life with husband. i remember the tears welling up in his eyes as he said his vows. i remember my heart feeling like it would burst at that moment, that i couldn’t possibly love him any more that right then. that my heart couldn’t be any more filled. it now was so surreal, standing there in the spot where we committed our lives to each other, this time holding a tiny little hand in each of ours. look at how our lives have been blessed in these 4 short years. and yet as i stood there, the tears welled up in my eyes this time. my other hand, empty, reminding me of what were missing. that’s how it is… all the time. there is always a reminder somewhere. even on the happiest of days. where is the break from that?